Saturday, March 26, 2016 Ride the beautiful, relatively flat country roads around Metter, the Capital of B.R.A.G. and Georgia's only "Bicycle Friendly Community". Ride lengths are 10, 25 and 62 miles. Enjoy Another Bloomin' Festival in the downtown park after the ride. There will be arts and crafts, sidewalk sales, food and entertainment. 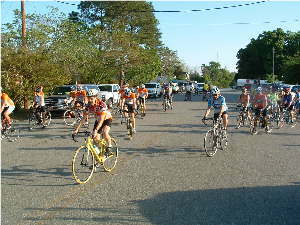 The ride is sponsored by The Metter Kiwanis Club and benefits the Local Youth Programs. ​DIRECTIONS Metter is located 60 miles west of Savannah on I-16. From Atlanta, take I-75 South to Macon. In Macon, take I-16 East to Metter exit (104 miles from Macon). Turn left at top of exit ramp on Hwy 121/23. Follow this route to traffic light and turn left (Broad Street/Hwy 23). Go two blocks to Kennedy St. turn left. Candler County Courthouse (registration site) will be on your left. Registration opens at 7:00 AM. Ride begins at 7:30 A.M. Sorry, showers are not available.